Posted: April 28, 2014 7:28 p.m. 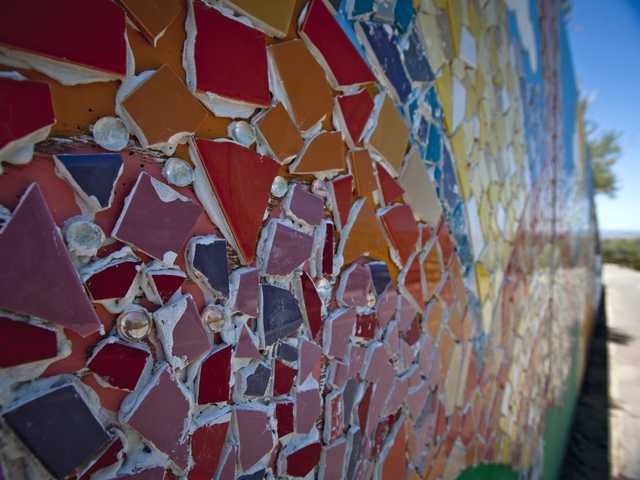 Updated: April 28, 2014 7:28 p.m.
Shards of red, orange and yellow tile lined a 40-foot-long mural on the bike trail that parallels Creekside Road on Monday, forming a shining sun setting over green fields with blooming flowers — a community’s hopeful reflection of itself. More than 200 people from throughout the community helped create the mural last weekend — but those who missed the opportunity will get another chance this weekend. 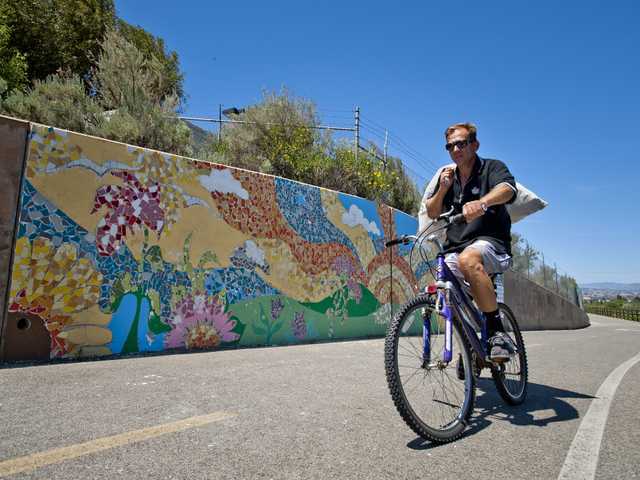 The mural, funded through a $4,000 grant from the city of Santa Clarita, is intended as a community engagement project to add more art to the city. The tile was donated by interested individuals and by Southern California Tile & Home Center, located in Newhall. The event is perfect for those who might feel intimidated at creating public art work, said Dianne Foderaro, vice president of The ARTree and the grant writer for the project. Shelly Mussenden, artist and designer of the mosaic, said she expects it to be completed this coming weekend. Hernandez asked Mussenden to design the mosaic after she attended several ARTree meetings. She produced the original drawings for the mural. Anyone is welcome to contribute Saturday and Sunday, May 3 and 4, from 8:30 a.m. to 3:30 p.m., when Mussenden and volunteers will complete the project.